Our country house, in Magliano, in Barberino Val d’Elsa area, is located in a hillside position with views of the typical Chianti hills, rich in vineyards and with view on lovely charming old villages, Barberino Val d’Elsa, S.Gimignano, Gambassi and Montaione. Completely and very very carefully renowed maintaining the peculiar characteristic of Tuscany colonica house and furnishing with old family furniture: the result is a lot fascinating. The swimming pool is 7,37 x 4, high 1,20. I am an avid traveler, curious about the world, art and different foods . I love to elaborate the experiences made and bring back to the care and details of my country house, a bit of my creativity and my heart! To share the passion of Tuscany, its tradition and its beauty, this corner of paradise !! I loved our stay in this beautiful country house. The views were amazing and the kids got to enjoy the pool all to themselves. The nearby town provided lots of opportunities to shop and dine and we got to explore the olive groves and vineyards with our new found friends. I loved the spacious house that was tastefully decorated and furnished and the large garden. The hostess was also incredible - friendly and vocal and she really got the kids to warm up to her.I would love to visit again. "We spent a wonderful relaxing week here for our first wedding anniversay and it was perfect! We were lucky enough to have the entire gardens and pool to ourself as the larger apartment had not been rented so it was like having our own private Tuscan house amidst olive groves and vineyards. The photos really do not do the apartment justice, all the little rustic touches and attention to detail really made this a home from home. Within walking distance of the nearest town, Tavernelle, with it''s lovely quaint square where you can drink coffee and eat cake at a fraction of the cost it would be in Florence or Pisa, devour a delicious Italian ice cream or shop at the weekly market for some amazing bargains, this really is a great base whatever type of holiday you are looking for. Ideally placed between Florence and Siena in the Chianti region you have so much on your doorstep if you want to travel around and the peace and quiet of the Tuscan countryside if you decide to camp out by the pool! We had some great meals, one in Barberino Val d''Elsa at Il Campanellino, another at Vicolo dei Golosi on Vico d''Elsa and the final one at a lovely place recommended by the Silvia, the owner of the property, just outside Barberino called Sosta del Pio. Silvia was so helpful before and during our stay, nothing was too much trouble, she is a most gracious host and as welcoming as her lovely property. Just one tip on car parking: when parking in a limited time zone you MUST write a note of your arrival time and display it on your dashboard or purchase a parking disc (3 euros at the Tobacconist in Tavernelle square) and set it at your arrival time, or like us you could find yourself down the local police station explaining you were less than an hour in the car park and still have to to pay the 39 euro fine, we''ll know next time :-) All in all a perfectly relaxing time in a wonderful location with so much on your doorstep and a wonderful welcoming host, thank you for everything Silvia!" The decoration was really tasteful. The site and the view over the valleys of Tuscany was breathtaking. Overall? We hope to come back as soon as possible!" "Description of the house in Homelidays fully compliant. The house is located on the top of the mountain with the perfect view to the surrounding area. Lovely and quiet place for a family holiday. Playground for kids provided. We had a lovely time there and are happy to recommend the place to anybody interested to spend holidays in the perfect Tuscany atmosphere." "This place was better than in pictures. Very good situation. All important sights in nearby." "The house was a perfect fit for us; it was comfortable and well equipped. The views were wonderful and the sunsets unforgettable. It was close to the town of Tavernelle, with bakery, coffee shops, restaurants, etc. and close to the supermarket." The kids enjoyed the pool the most! 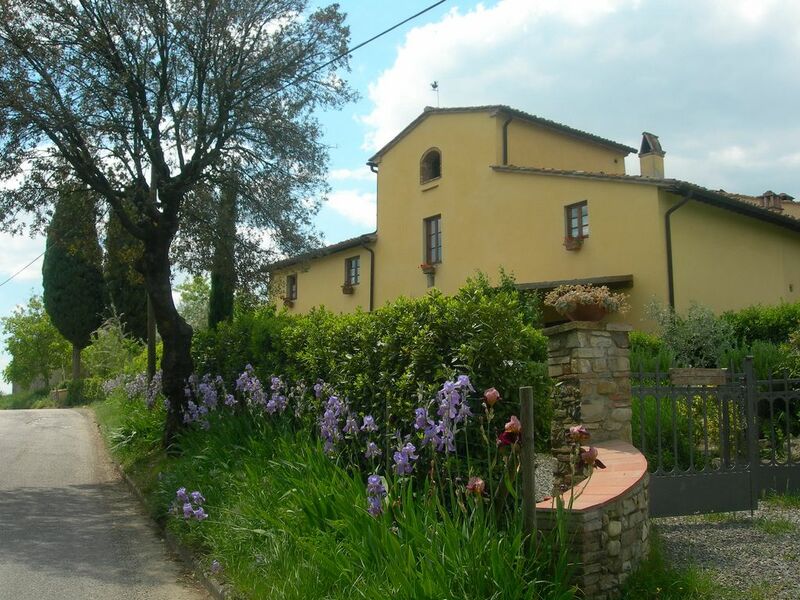 A perfect location to explore vineyards, towns, and close to Siena and Florence. We could not have asked for a better experience. 8 km from Poggibonsi (all kinds of shops, public swimming pool) and by taking a very panoramic road you can easily reach the famous historic centres such as: Barberino Val d’Elsa (3 km), Tavarnelle Val di Pesa (1 km), San Donato (10 km), Certaldo (13 km), S. Gimignano (19 km). Siena and Florence are to approximately 30 km.